In the last post we saw how you can easily create a JTree using an array of strings. The JTree however did not display the values in a hierarchy but displayed all the values at the same level. 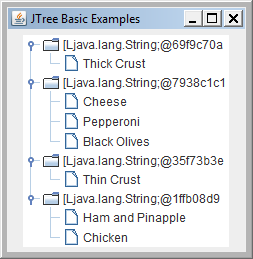 So in this post we will build our Java Desktop Application using JTree with a hierarchy. 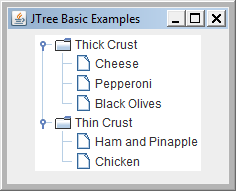 If we want to build a JTree with a hierarchy then we need to use Tree Nodes. There are a two TreeNode interfaces provided in the swing package, TreeNode and MutableTreeNode as well as a concrete class DefaultMutableNode. Here we create a DefaultMutableTreeNode for each of the parent nodes. We can then add children and nodes to a parent. Another difference is the constructor we now use means the JTree is created using a node set as the root and will display this by default. In the previous example the constructor used resulted in hiding the root node by default, in this case we explicitly created a root node and therefore have to hide it using setRootVisible(false). The use of the constructor means that we also do not get handles to expand and collapse the nodes with children, to get that to display we call the setShowsRootHandles(true). Now all this is fine but, usually when we use a JTree it is because we want to be able to select an item, one or more and display additional information based on the selection. In the next posting we will take a look how we can accomplish this.